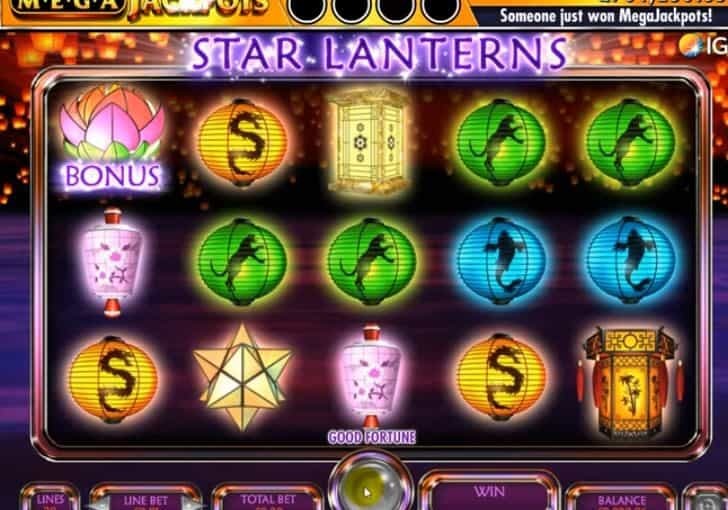 MegaJackpots Star Lanterns Online Slot is a 5 reel, 20 payline Chinese-themed progressive slot and it is powered by IGT. The reels are made up of 7 brightly coloured lanterns, ranging from paper shades with animal patterns to beautifully decorated lanterns. The Star Multiplier feature will award each Star symbol with a 2x, 3x or 5x multiplier. If you collect 2 or more Star symbols during a single spin, then the multiplier values is also added. For example, 3x and 5x equals an 8x multiplier! You have a great Free Spins Bonus feature which is activated when you collect 3 Bonus scatter symbols on reel 1, 2 and 3. You can choose from 1 of the 3 lanterns to reveal between 4 and 14 free spins! The jackpot will be won when you collect 4 MegaJackpots symbols on a single spin and there’s also a Second Chance which can award you the jackpot too.